In about a week, we will be celebrating the third anniversary of our move into our home in Santiago to become directors of the Sparrow Children’s Home. Three years ago when we began this journey, we had solely a vision, one house, and about 5 acres of property with no idea how it would look in 2018 (or beyond). Now, we are a vibrant community with two more families on site, seven wonderful foster children between two families (and one family to begin accepting children soon), several ongoing ministries in which staff are involved, and connections made to the people around us as we have integrated into the framework of life here in Santiago. Not only that, we are blessed to add another member to our ministry family this year as Tía Leah (Gruneisen) joins us on site as well. So many testimonies how God has done incredible things in and through our ministry these past three years, and great excitement at the thought and prospect of what He will do next. So I could just stop there and give God the glory for all the incredible high points and victories we have seen, but it would be a disservice to what we have seen through the low points as well. Because inevitably they come right? For every story with a happy ending, somewhere along the way there was a struggle that somehow brought God glory as well. We all know as Christians there is no such thing as a life lived without struggle. It differs for everyone, but they always come. I mean, Jesus even gave us a big warning sign while he was on earth right? Remember when he said in John 16:33 that “…in this world you will have trouble…”? Well, thankfully he didn’t stop there, and went on to let us know we can rest easy because he has overcome the world. Not that there will always be a sunny side or silver lining to every struggle we face, but that ultimately we can have peace in knowing he is always in control. For us here, those struggles can present themselves weekly in the forms of hours spent in the bank, repeated car troubles, frequent power or water outages, trying to master a second language, or any number of other day to day issues that come about. For every wonderful photo you see of missionaries loving on their communities and looking like they have it all together, there are ten times more moments of struggle each and every day. And it is the same for all of us. Those times come, but the good news is…it’s normal. Recently, our struggles have come on a more emotional and familial level as well. While God has helped our daughters begin to adapt and settle in more to life here, there are still moments they miss living in the US greatly. Especially on days when other factors make life a little more difficult here, it is easy for them to escape into thoughts of moving back to Kentucky or living stateside once again. There is a level of frustration and fear for us as well that comes from uncertainty of the future of the four precious Honduran children that have become part of our family. Will adoption laws become less restrictive for non-citizens? Will trying to adopt ultimately lead to the children being placed with another family? We know that God has a perfect plan, but sometimes it would be nice if we got at least a little bit of a spoiler, right? And finally, another struggle for us has been trying to maintain a healthy marriage and family dynamic in the midst of all the other factors pulling all of us in every direction. If we are not careful, all those struggles and stressors can eat into our personal lives if we allow them to affect the most important relationship of all…our walk with the very God who has already told us he has our back. In the past several months, we have made a concerted effort to have a nightly family devotion at the dinner table. Roxanne and I simultaneously go through devotion plans in our Bible app together and message each other nightly as to how God is speaking to us. All of this while each of us independently as well making sure we are walking with God daily through reading His word, meditation and prayer. All of this has led to us to keeping a greater sense of peace in our lives and in our homes. Oh, there is still stress and there is still fear and doubt from time to time, but I can’t even imagine how much more that would be magnified without a healthy relationship with our heavenly Father. And that is what I have learned and what God is teaching me now more than ever. That no matter how hard I may pray for deliverance from them or how hard I may try to avoid them, struggles are gonna come. The question is, will I allow God to prepare me and guide me through them? And you know what, that is okay. The world teaches us sometimes that if things don’t come easily, then we must be doing something wrong. So if struggles are present in our lives, then something must be out of whack. But as Christians, we know that this is not the case. In fact, a lot of times you find those struggles even more rampant when our walk is as strong as it has ever been. Struggle is not necessarily a symptom, but it is an inevitability. You can’t prevent it. You can’t find a shortcut around it. However, you can endure it. So, yes, the struggle IS real, but, again, so is God. The same God who told us we can take heart, or have peace, because He has overcome the world. Not just our personal problems or struggles, but the world. No, the sun doesn’t always come up tomorrow, and the struggles we face can be downright unbearable from time to time. However, by staying strong in our relationship with God and walking with Him daily, He will strengthen us and help us as we pass through everything life doles out for us. And He will uphold us. 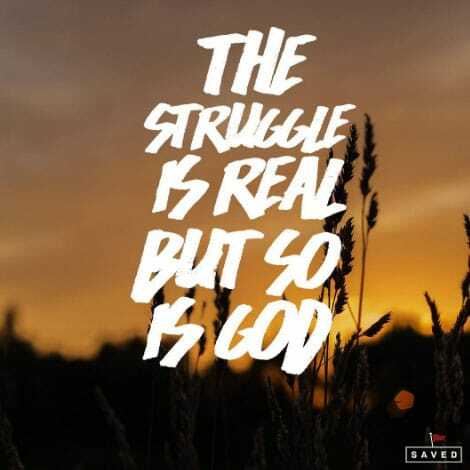 The struggle is real, but so is God!